This week saw the return of my children and husband back to school and work, respectively, after a long Spring Break. Despite it’s length, it was nice to have everyone home and relaxed. We didn’t have to wake up early and rush to get breakfast or to make packed lunches. The mornings were a most civilised affair and that’s probably because only my husband and I were up before 2 pm! I love having my husband home and feel a bit depressed when he starts back to work. However, as much as I love him and love having him home, he does disrupt my routine! So, I am glad to see everyone back to school and work just so I can have my sanity and house back. We did go for a mini vacation to South Dakota and Wyoming. It’s only a six hour drive from here and we thought it would be nice to get away for a couple of days. It was nice. Very nice. South Dakota is beautiful and Mount Rushmore was quite impressive. The Black Hills were just gorgeous and the weather was great. 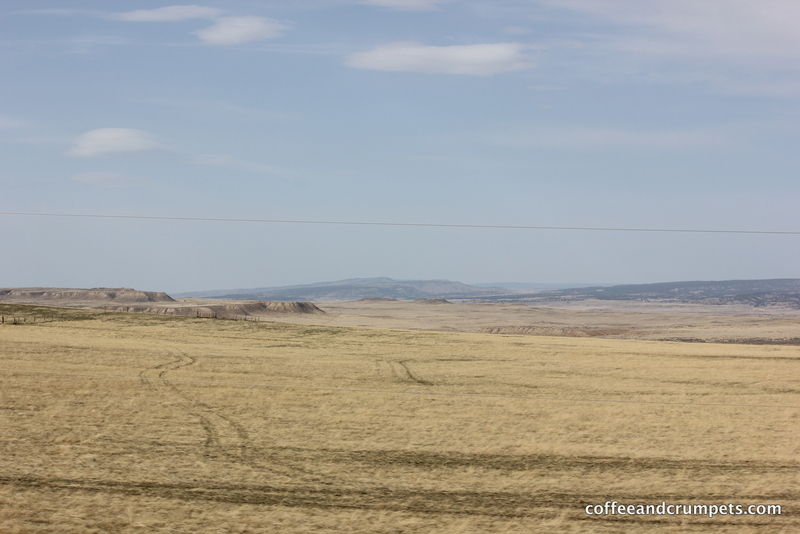 I was really taken by the beauty of South Dakota with it’s green rolling hills intermingled with endless plains. Driving through the Black Hills National Forest and just staring at the canyons and waterfalls; the dark pines that make the Hills “black”, strolling through the Old West town of Deadwood, it was all just a fabulous experience. My husband and I decided that we would definitely visit again. 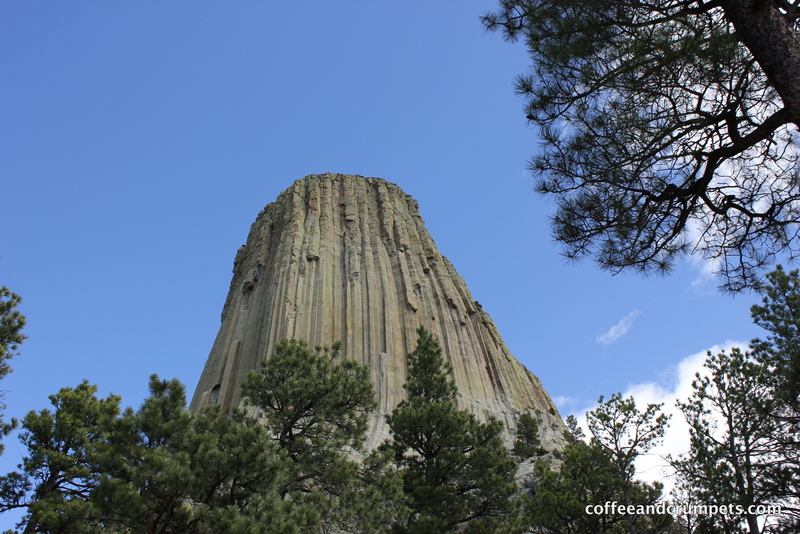 We also took a side trip into Wyoming to visit the Devils Tower, made famous by the film “Close Encounters of the Third Kind.” My husband is a very big Sci-Fi nerd enthusiast…OK, so am I. I loved the Devils Tower, which is, by the way, the very first National Monument. We took a mile hike around the base of the Tower and my husband complained of neck pain after, because we couldn’t stop looking up at it. It was mesmerising. I was just intrigued with the geology and the formation. Nature never ceases to amaze me. You would think that I would have plenty to tell you about all the great places we went to for lunch and dinner. My eating experience was poor at best. The best thing we ate on or trip was the Papa John’s pizza that we had delivered at 10 pm. I am not going to even write about the bad food, let’s just say, I was up at midnight the first night, throwing up. Not fun. OK, now with that image in your head I will continue onto this recipe. When we order pizza at home, we only order cheese and vegetarian. I am dubious about the suspect meats that appear on a “supreme” or even just “hamburger”. 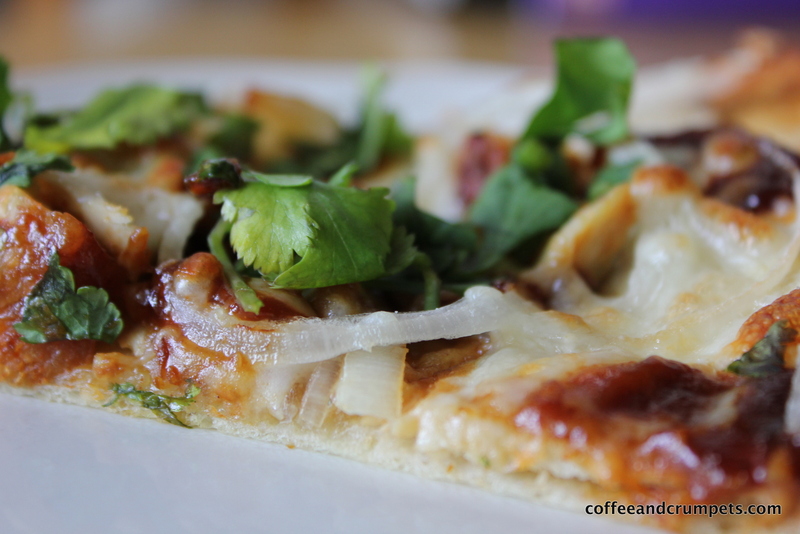 My children prefer them plain anyway except for when I make this BBQ chicken one; inspired by the California Pizza Kitchen BBQ pizza. It’s pretty straightforward and you can substitute a pre made pizza crust but pizza dough is not hard to make. As with any yeast dough, you will need a couple of hours to let the dough proof. Here is one good thing about high altitude baking; yeast doughs rise in no time! I can make fresh pizza in less time than it takes to get it delivered. 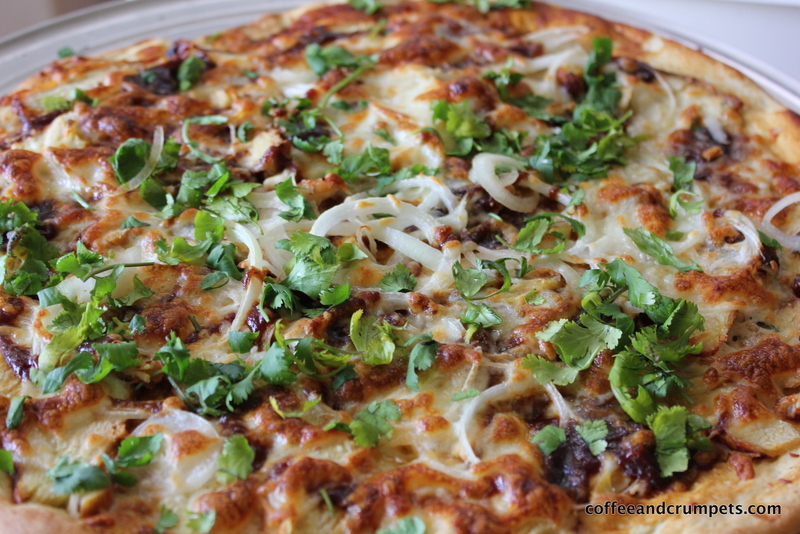 Here are the must haves to make this pizza taste great: cilantro/fresh coriander and red onions (though sweet white will work in a pinch.) If I don’t have these two ingredients; I don’t make this pizza. So this recipe makes dough enough for 2 thin crust large pizzas or 1 deep dish (I use a large sheet pan) or 4 medium thin crust pizzas. Grill the chicken breast ahead of time or if you have leftover roast chicken; this is a great way to use it up. You can make your own BBQ sauce, but I am not that into BBQ sauces, so I just buy it. There is also no real quantity to this pizza; you can add as much topping as you like or your dough can handle. Just remember that if you like your pizza crispy, too much topping will weigh it down and make the crust soggy. Proof the yeast in the warm water with the sugar. Leave it aside to get frothy. Meanwhile, add the flour and salt to the bowl of a heavy duty mixer (easiest way, but you can do this by hand) and attach the dough hook. Once the yeast is nice and frothy, add the olive oil and slowly pour into the flour. Mix until a dough forms and knead with dough hook till you get a soft, smooth dough. It can take 5 to 10 minutes to get a nice smooth dough. Depending on your humidity or dryness, you may need to add more flour or more water. The dough should not be tacky or wet, nor should it be dry and flaky. The perfect dough is soft and smooth. Once you achieve the right consistency, oil a bowl and the dough and cover. Put aside in a warm place to rise and double in size, about an hour or two depending on the warmth of your kitchen. You can do this on a pizza stone but when I don’t want to fuss with making individual pizzas, I use sheet pans or pizza pans to make family style pizzas. Once the dough has risen, take it out of the bowl and put on the counter to roll. First, divide the dough in half if you want two thin crusts. Keep one piece covered. I use a pin to roll it a little and then use my hands to stretch it out. If you grease the pans and place the half rolled dough on it, you can stretch the dough by hand to fit the pan. If the dough resists and keeps returning into a clump, let it rest for a few minutes and then try again. Once you have the dough ready in the pan, brush a little olive oil on the dough and add a tablespoon or two of the BBQ sauce on the base…not too much. Add the chicken, onions and cheese and then drizzle with more BBQ sauce. Place on the bottom rack of the oven and cook for 10-15 minutes or until the cheese is melting and bubbly and the crust is golden. Take out the pizza and let cool, and then add the cilantro. Everybody has a soft spot for pizza, Why is that? After all, it’s only bread and cheese….I think I just answered my own question..mmm…bread and cheese. What could be better? What’s your favourite pizza? We all have one. Thanks for reading and I hope those of you celebrating Easter and Passover have a great one with your family and friends. Thank you Sissi! The pizza is pretty good. I was just as bowled over when I saw the landscapes. Living here people don’t talk about rural South Dakota which much gusto but in fact, it’s really beautiful. It’s the rural-ness that makes it so attractive. I enjoyed my visit thoroughly. There are so many places I want to visit, I hope I have enough time! This recipe sounds delicious. I will try it soon. I know what you mean about the food when one is on a trip. I am sure one could find good food somewhere, but I certainly don’t know where. If we are driving cross country we always have a cooler with sandwich makings, etc. Even when we just journey to Denver for the day we bring our own sandwiches and snacks. Almost anywhere one stops to eat at a reasonable price means substandard meals. This is one reason why we very rarely eat at a restaurant. Also, I don’t like to think about where the food came from. Let me stay home and eat my homegrown food! Looks like I will never go anywhere again, doesn’t it? Thank you! I know what you mean about the food. We do take sandwiches and snacks but everyone digs into those before we even leave the State! I always look up Food Network for restaurants that are featured and they had a couple of swanky ones in SD but I wasn’t going to take all my kids there! Cost a fortune! We did go to this casino/restaurant in Deadwood and it was cheap but the amount of food correlated to the price! That’s the night we had pizza at 10pm :)We’re thinking about driving to Moab or Las Vegas this summer, the food choices are already worrying me. Though Las Vegas should be ok. It was a fun trip. It was just nice to get away. 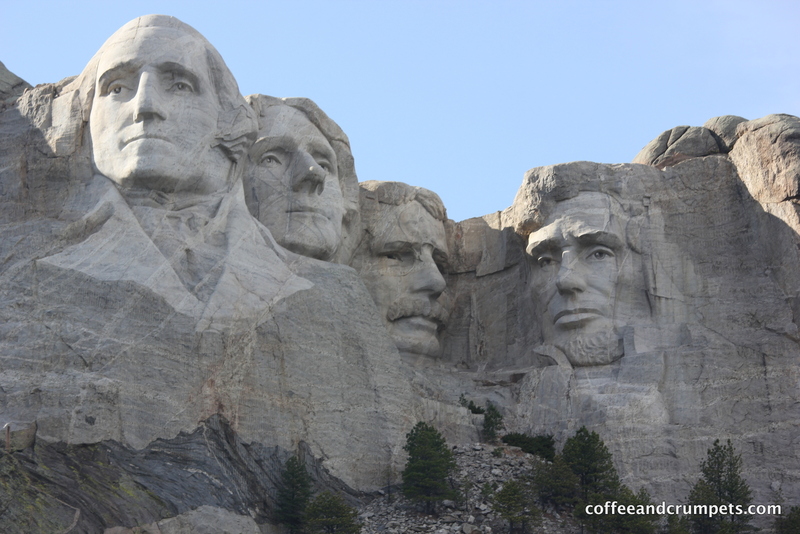 I have to tell you that when I first saw MT Rushmore, I was thinking “that’s it?” They look so massive in the pictures, but in reality, it’s quite far up and so they look small. After walking around though, I was just very impressed at how they managed to do it. It’s pretty cool. I think it’s time to treat your Glam Teens to some home made pizza! Very unusual and impressive landscapes. I would love to visit these places on day. The pizza looks fabulous. I love the colours, the toppings and the thin crust. Have a lovely weekend!